BOSTON — Brad Marchand and Charlie Coyle scored during a raucous first period as the Boston Bruins downed the Toronto Maple Leafs 4-1 on Saturday to even their first-round playoff series at one game apiece. Danton Heinen and Patrice Bergeron had the other goals for Boston, which flexed its muscle following a lacklustre effort against the speedy Leafs in Thursday’s opener. Tuukka Rask stopped 30 shots, while Marchand added an assist. Nazem Kadri, who could be facing another suspension after crosschecking Jake DeBrusk in the head late in the third following a three-game ban in last spring’s series against the Bruins, replied for Toronto. Frederik Andersen made 37 saves in defeat. Game 3 of the best-of-seven matchup goes Monday at Scotiabank Arena. The Leafs neutralized Boston’s top line of Marchand, Bergeron and David Pastrnak at 5 on 5 in their 4-1 victory in Game 1, while also using their superior quickness to expose 42-year-old defenceman Zdeno Chara. Boston came out of the gate with a purpose, hitting every Toronto player in sight and building a 2-0 lead after 20 minutes inside an electric TD Garden. Andersen made terrific early stops on Pastrnak and Jake DeBrusk, but could do nothing on Coyle’s opener. Inserted into the lineup after getting healthy scratched for Game 1, veteran winger David Backes was first to a loose puck behind Toronto’s net after a Nikita Zaitsev turnover before feeding Coyle in front to bury a shot past Andersen at 4:44. Boston then went ahead on another Toronto defensive miscue at 16:04 when Muzzin whiffed on the puck with his glove in the neutral zone. Pastrnak promptly fed a no-look-behind-the-back pass on a 2-on-1 to Marchand, who delayed before sliding a shot through Andersen’s pads as Boston led 24-12 in shot attempts after one. 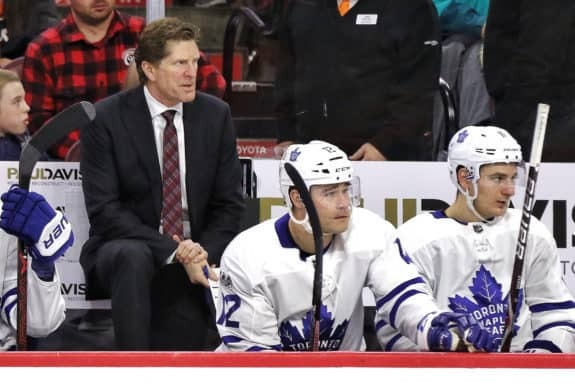 The Leafs, who lost to the Bruins in seven games in both 2013 and again last spring, could do nothing with a power play that stretched between the first and second periods before Andersen made two more big stops on DeBrusk and Karson Kuhlman. 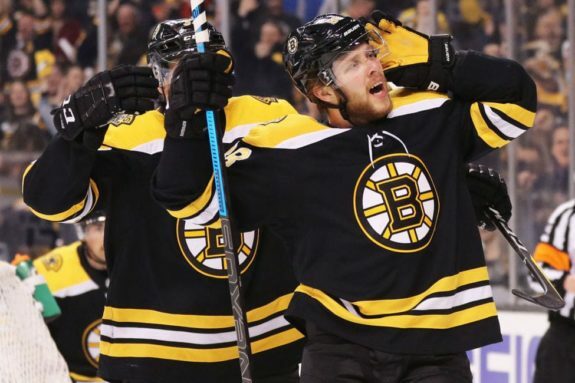 Krug did not return, but the Bruins scored just 11 seconds later when William Nylander inexplicably lost the puck at the side of Toronto’s net, leaving an easy tap-in for Heinen behind a helpless Andersen at 10:39. Andersen — by far the best Leaf — robbed Heinen with an exceptional glove save before Rask made a toe stop on Andreas Johnsson at the other end. Kadri and John Tavares were denied on a Leafs’ power play, and Zach Hyman hit the post as the visitors tried to respond. Kadri was assessed a hooking penalty late in the period, and as he raced to get back in the play, grabbed the puck and took a knee-on-knee hit from DeBrusk. The Leafs centre stayed down, skated off on his own and returned for the third. Andersen continued to do his part, robbing Marchand with his glove at the side of the net early in the final period. Toronto got a power play five minutes into the third, but could do nothing until Kadri broke Rask’s shutout bid on a deflection at 10:44. Kadri, who was suspended three games for boarding in last year’s series, got a five-minute major and game misconduct for crossching DeBrusk in the head after the Bruins winger hit Patrick Marleau into the curved glass at the end of the Bruins’ bench. Bergeron scored on the ensuing power play at 15:03 as the Leafs now turn their attention to Game 3 — likely without Kadri. Notes: DeBrusk played despite missing Friday’s practice. Marcus Johansson (illness) sat out for Boston. … Rob Gronkowski, who retired from the NFL last month after nine seasons with the New England Patriots, revved the crowd up before the opening faceoff. … Game 4 is set for Wednesday at Scotiabank Arena.